“Miracle Chair” makes miracles, that is absolutely logical but absolute miracle, too. Judging about Earth miracles one can say definitely that the “guarantee” miracle to happen is to believe in it. 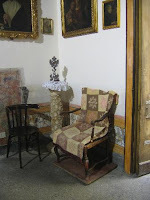 And if one believes, an ordinary armchair under a worn blanket in Naples will make childless families happy. The gift of the miracle is nothing but the child. The “miracle chair” is close to Speranzella. The street name suggests hope -- in the picturesque Spanish Quarter of Naples. And at this place Saint Mary Frances of the Five Wounds of Jesus is asked for a miracle. This place became one of the mostly visited by the religious tourists and especially by the childless families. The phrase visitors can hear the first is “The saint is waiting for you.” That is Sister Elisa who says that to the men and women. After worshippers finish praying they are led to a steep staircase and along a narrow corridor into the flat where the saint, born Anna Maria Rosa Nicoletta Gallo, spent half her life in chastity and mystical suffering until her death in 1791 at the age of 76. Reminding about “voluntary penance” are the hair shirts and whip in the room. Judging through the name of the first saint woman in Naples, she was the carrier of the wounds of Jesus. The research shows that visit to “miracle chair” should be intensified if consider the statistics about young couples’ behavior and the decisions that are made for the last years. San Grewal, staff reporter of TheStar.com writes in the article that for the first time, there are more families in the country without children (42.7 per cent) than couples with children (41.4 per cent). Twenty years ago, 52 per cent of Canadian couples had children, defined as offspring younger than 25. There are two primary reasons for the trend, says Anne Milan, a senior analyst with Statistics Canada: An aging population of empty nesters, and historically low fertility rates. More women are either putting off or forgoing parenthood, Milan says. The reasons of childlessness might be by choice and by chance. Though there are some definite reasons that cause the problems for those who are childless by chance, not by choice.